HERE COMES THE SUMMER Summer follows close on the heels of Spring, the weather improves and before you know it, it’s Holiday Time. Our summer programme is here to give you lots of ways to enjoy the days and nights to come. This season our Conversation is inspired by Elmer the Patchwork Elephant Show with summer activities and workshops designed to include even the very youngest of our audience members as we think about wildlife and the environment it depends on. There are lots of ways to get involved in the Conversation whether you are a young person entering our Epic Art Challenge or coming along to the Arthouse Exhibition when the entries will be available for everyone to enjoy. We are interested to hear what you have to say. There are many reasons to tap your feet and get into the groove with a summer line up of exceptional theatre which features some of the best of Scotland’s music played live; Cora Bisset’s rise to indie rock stardom brings the band of her memories back to life on stage in What Girls Are Made Of; in The Guitar Man Jon Fosse faces one man’s question of when to play on and when to stop; and the National Theatre of Scotland will make it hard to sit in your seat as every cast member plays their heart out in the legendary epitome of ‘a good night out’, John McGrath’s The Cheviot, The Stag and the Black, Black Oil. Children are also invited to join the beat with Soundcycle as Children’s Classic Concerts continue their commitment to making music fun and to sing along with their families at Shark in the Park. In August the National Theatre of Scotland will return with a stage adaptation of Jackie Kay’s autobiographical, Red Dust Road. Jackie graduated from the University of Stirling in 1983 and was awarded an Honorary Degree from the University in 2000. Follow her journey from Nairn to Lagos in search of her birth parents and discover the roots that shaped her life. These are just a few of my highlights from our stand out season – read on to find your own ‘great night out’. There is a fantastic selection of shows to come along to and activities to do but why stop there? Our Social programme invites you to; meet visiting artists and find out more about what’s on at your local Arts Centre at the Season Spotlight; share experiences of creativity in your life with other creative people at Creative Breakfasts; and come to our neighbourhood get together The Big Lunch on Sat 1 June. Whatever takes your fancy we are looking forward to meeting you, getting to know you better and to sharing good times with you this summer here at Macrobert Arts Centre. Join us for a preview of this season’s events. Hosted by our Artistic Director Julie Ellen you’ll get a taste of what’s on offer from May to August – hearing first hand from some of the artists involved. You’ll also get the chance to try some mini-samples from the menu on offer in the Café/Bar at Macrobert Arts Centre. You’re invited to join us for a chat over breakfast, as we host a regular gathering by and for Stirling’s creative community. Whether you’re a professional practitioner, an art student or simply enjoy getting creative in your spare time, you are very welcome. Meet inspiring, creative people, share projects and ideas and hear from a different speaker every month. Venues vary please check our website for details. What happens when your world is turned upside down and you have to find your own way? When triplet sisters are abandoned in a forest by their father, one walks one way to find purpose, another the opposite way to find adventure and the third stays right where she is. Over many years having grown forests, baked cakes, explored oceans, fought Vikings and built homes… the sisters, now women, meet back in the forest where it all started. Tue 14 May, 7pm Broadcast live from The Old Vic in London, Academy Award-winner Sally Field (Steel Magnolias, Brothers & Sisters) and Bill Pullman (The Sinner, Independence Day) star in Arthur Miller’s blistering drama. America, 1947. Despite hard choices and even harder knocks, Joe and Kate Keller are a success story. They have built a home, raised two sons and established a thriving business. But nothing lasts forever and their contented lives, already shadowed by the loss of their eldest boy to war, are about to shatter. 25% off most live event tickets 10% off classes & workshops Concession priced tickets for event cinema 10% off all dine-in food on the menu in the Café/Bar Priority booking for our Panto Panto ticket discounts Priority booking for key films Priority booking for live events Exclusive news and info Friends Look out for the Friends 25% OFF symbol throughout this Live Guide! The Royal Ballet presents contemporary works from three of today’s leading choreographers. Wheeldon's Within the Golden Hour is based around seven couples separating and intermingling, to music by Vivaldi and Bossi. Pite's Flight Pattern, revived for the first time, is a poignant and passionate reflection on migration. Between them, a new work by the acclaimed choreographer Sidi Larbi Cherkaoui, has its premiere, bringing the contemporary truly up-to-date. Thu 23 May, 7.30pm It’s a place we all know but have never been… A forest, a desert of ice. The land of ancient gods, wild animals and strange creatures. The home of the Terrible and the Sublime… A bleak yet whimsical story of a young man who finds himself lost in the harsh yet delicate wilderness of The North with only himself and two eccentric Northerners for company. Get More: Sign up for a masterclass with dancers from the Company (see P21). Everything has its time, a man and a piece of music... A man makes his living singing the same songs day after day on the edge of town. He plays to an audience that is always passing him by. One Winter’s night, he tells us his story. Searching for answers to his past, present and future, he reaches a decision: to stop playing. Weaving text, song and silence, this show traces the delicate balance between loneliness and longing, loss and salvation. A new multi-sensory story of adventure and homecoming for young people with profound and multiple learning disabilities. A lighthouse keeper lives on a desolate outcrop surrounded by stormy seas. Duty bound to maintain the light that guides boats away from danger, she lives a solitary existence. One day a runaway lands on the shore, together they face the inevitable. Change is on the horizon but not in the form she expects. Sat 1 Jun, 2.30pm to 4.30pm We’re getting involved in the UK's annual neighbourhood get together and you’re invited! Since it all began back in June 2009, millions of people stop what they're doing and gather with neighbours in a nationwide act of community and friendship. There will be lots of things going on at Macrobert Arts Centre to celebrate the Big Day and it’s all totally free. Just bring a picnic, and if you’re happy to share with friends, old and new, then all the better! This legendary piece of Scottish theatre tells the story of the exploitation of Scottish lands, waters and people over the centuries. From the highland clearances to the oil boom, this is the universal tale of how the greed of a few blights the lives of many. Add a generous dose of Scottish rebellion and irreverence. Throw in some live music and a riotous ceilidh - you’ve got yourself a rollicking great night out. Shakespeare’s enduring love story is known the world over. Since its 1965 premiere with The Royal Ballet, Kenneth MacMillan’s ballet has become a modern classic. The choreography captures the emotions of the young couple as they fall in love, despite the barriers that finally bring about the story’s tragic end. The whole Company brings the colour and action of Renaissance Verona, where a busy market all too quickly bursts into sword fighting, and a family feud leads to tragedy for both the Montagues and Capulets. Mon 17 Jun, 7pm (Braes branch) Tue 18 Jun, 7pm (Braes branch) Central Scotland Ballet School is delighted to be back at Macrobert Arts Centre with around 700 young dancers performing in a show inspired by music of the silver screen. The dancers showcase a range of dance skills including ballet, tap, jazz and acrobatics. HEARTSORE / 911 Fri 21 Jun, 7pm Join Petre Dobre, Macrobert’s BSL Trainee Director, for a sharing of two pieces of performance in development as part of his Year of Young People residency. Petre’s performance style is imbued with all the kinetic energy and precise expression of someone whose communication is always visual. His work is intrinsically accessible to hearing and Deaf audiences alike. Heartsore: Lovers dance through life but what happens when the music stops? A celebration of the joy and pain of a love lost. 9/11: An intimate portrayal of that terrible day in 2001 through the lived experience of one imagined man. Scotlands premier showband are back at Macrobert Arts Centre with a celebration of music and song by some of the greatest entertainers to have graced the iconic venues of Las Vegas. From the big bands of Glenn Miller and Benny Goodman to the latest from Paul Simon, Eric Clapton and The Eagles; from the standards of Sinatra and Quincy Jones to the showmanship of Elvis and singer songwriter Barry Manilow… and so much more. Look forward to an uplifting night of Vegas fun, charm and humour. Our Epic Art Challenge is back for 2019 and here’s your chance to enjoy a selection of artworks by young people aged 5 to 18 from across Stirling and Forth Valley. This year’s challenge is to draw / paint a bird or animal affected by an environmental impact and we look forward to sharing a selection of our favourites in this exhibition. Interested in submitting a picture to the Epic Art Challenge for the chance to be part of this Exhibition - see P15. You can visit this exhibition whenever we’re open (with occasional exceptions for closed events – please check with the Box Office). Take a journey from Jamaica to Britain, through the Second World War to 1948 – the year the HMT Empire Windrush docked at Tilbury. This play follows three intricately connected stories. Hortense yearns for a new life away from rural Jamaica, Gilbert dreams of becoming a lawyer, and Queenie longs to escape her Lincolnshire roots. Hope and humanity meet stubborn reality as the play traces the tangled history of Jamaica and the UK. 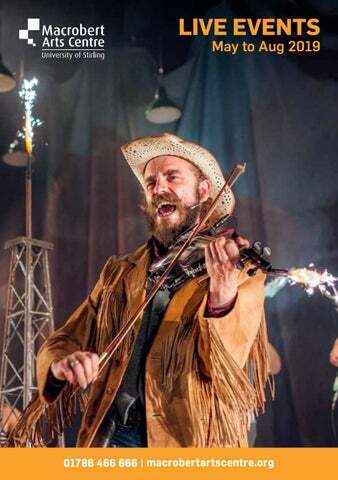 Shakespeare’s most heartfelt and human tragedy comes to life in a sparkling new production by Scotland’s premier Shakespeare company, Bard in the Botanics. A student returns home from university to attend their father’s funeral and finds their whole world turned upside down. Was it murder and is Hamlet destined to avenge her father’s death? A collection of four new and exhilarating contemporary dance works, created by top choreographers and performed by some of the UK’s best young contemporary dancers. The annual Project Y tour showcases the breath-taking talent of some of the UK’s best young contemporary dancers aged 16 to 21 upon completion of the four-week intensive dance training programme, the Project Y Performance Course. Family | Mainhouse Elephants, as everyone knows, are big, have trunks, and are grey. But Elmer is a patchwork of brilliant colours! His fun-loving and cheerful personality keeps everyone in a playful mood, until the day he gets tired of being different and tries to blend in with the herd. Based on the classic children’s book series by David McKee this show features a menagerie of 21 loveable puppets. A collection of drawings and paintings by young artists aged 5 to 18 (P10). (Find out how to get involved on P15). Sun 28 Jul, 1pm to 5pm Have a go at some hands-on activities and get inspired about simple changes and activities that you can do to help take care of our environment from organisations like Plantlife Scotland and the RSPB. This epic Disney adventure is coming to Macrobert Arts Centre this summer. Summer Activities Weâ&#x20AC;&#x2122;re planning some fun summer activities, so keep an eye out for more details coming soon. Wed 31 Jul & Thu 1 Aug, 7.30pm The dazzling Divas return to Stirling to celebrate their 21st birthday with The Greatest Show Girls Tour! Showstopping performances will bring you to your feet time and time again as the glamour of Hollywood and the glitz of Las Vegas meet the beloved traditions of classic British music hall. Get ready for a bubble of laughter, beauty, splendour and music. Rubber Chicken Theatre are back with this year’s Show in a Week featuring over 150 local kids, an orchestra and a very famous flying car – Chitty Chitty Bang Bang. Can Potts, the loveable but whacky inventor, his two children and Truly Scrumptious outwit Baron Bomburst? What happens when the children are caught and imprisoned by the evil Childcatcher? Will it all end happilyever-after? Of course it will! Tickets: £13 / £9 Conc *This will be a Relaxed Performance designed to welcome people with an Autistic Spectrum condition, sensory and communication disorders and people living with dementia. Your chance to enjoy a preview of the autumn season’s events, hearing first hand from some of the artists / directors about their performance, in conversation with Julie Ellen (Macrobert Artistic Director). Timothy Pope is looking through his brand new telescope – but wait! What's this he spies? Is that a shark? In the park!? Join him (and his telescope) on three exciting adventures in search of one very mysterious shark! Share the magic of Nick Sharratt’s wellloved children's stories - Shark in the Park, Shark in the Dark and Shark in the Park on a Windy Day - live on stage! ‘You are made up from a mixture of myth and gene. You are part fable, part porridge.’ Growing up in 70s’ Scotland as the adopted mixed raced child of a Communist couple, young Jackie blossomed into an outspoken, talented poet. Then she decided to find her birth parents… From Nairn to Lagos, this production takes you on a journey full of heart, humour and deep emotions. Discover how we are shaped by the folk songs we hear as much as by the cells in our bodies. Rapture Theatre make a welcome return to Macrobert Arts Centre with another classic of American theatre. In 1959, Bev and Russ are moving after the tragic death of their son. Inadvertently, they have sold their house to the neighbourhood’s first black family. Fifty years later, in 2009, the roles are reversed when a young white couple buys the same house in what is now a predominantly black neighbourhood. In both instances, racial tensions escalate and the stakes are raised. Tuesdays, 28 May, 25 Jun, 30 Jul, 27 Aug at 2pm With live entertainment and coffee, tea and biscuits, our Relaxed Events run once a month. They are open to everyone, but designed to welcome people who benefit from a more relaxed environment – particularly those living with dementia. You can expect a relaxed attitude to noise and movement and friendly staff on hand to help make your visit enjoyable. Tickets: £5 (assisting companion or family member goes free). These one-off workshops offer you the chance to Get More from our live programme and work with top artists and performers. Keep an eye on our website for more masterclasses as they are announced. 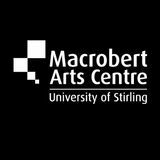 Did you know Macrobert Arts Centre is a registered charity? The University of Stirling is working on an exciting re-development project to build new facilities at the heart of the campus, creating a host of new study and social spaces for students, staff and visitors to use. This will mean a few changes for us at Macrobert Arts Centre and for you our customers, but we’re working with the University to keep the associated disruption to a minimum and help make your visits to Macrobert as enjoyable and easy as they’ve always been. Our front entrance is relocating so you’ll be coming into our building from a new double door on the loch side instead – there will be signs to point you in the right direction. You may have already noticed that Queen's Court (the large roundabout at the front of Macrobert Arts Centre) is closed to through traffic. The Blue Badge parking spaces will also be moving, but there are plans for a few more of these and you’ll still be able to drop off near our new main doors (most easily accessed from the Hillfoots entrance to the Campus). We welcome children and families and are fully accessible for prams and pushchairs and booster cushions are available on request for the Filmhouse. Mothers are welcome to breastfeed anywhere at Macrobert Arts Centre and we have baby changing facilities in both the men’s and women’s toilets in the main foyer and the Arthouse. There is also a changing places facility in the venue. Queen's Court (the large roundabout at the front of Macrobert Arts Centre) is now closed to through traffic, but vehicular access is still possible from the East Link Road (most easily accessed from the Hillfoots Road entrance to the University Campus). That means you can drop-off at our building and Blue Badge holders are able to use the disabled parking spaces. We charge a booking fee of £1 on phone and online bookings and are happy to post your tickets out to you for an additional £1. Ticket prices for most shows include a 50p contribution to our development fund, helping protect the future of Macrobert Arts Centre and improve our facilities. We’re unable to offer any refunds unless we cancel the event. We can try and exchange your tickets for a small admin fee - please contact the Box Office. Full time students, children (aged 16 & under), senior citizens, people with a disability and their assisting companion and *equity members (*proof of eligibility is required at time of booking / collection). We offer a limited number of free tickets for children (under 12 months old) who are sharing a seat with their carer at some family events – these must be booked in advance. Details of the live and event cinema programme at Macrobert Arts Centre from May to August in 2019.